This award-winning high dynamic range software instantly creates stunning and mesmerizing imagery from otherwise bland subjects and compositions. Have you ever looked at a well-executed HDR photo, ones with a dramatic sky and incredible detail, and wish you could shoot photography like that? Now you can! With Simply HDR this stunning art form is now accessible to everyone. Early on photographers were challenged to capture beautiful scenery, seen with their eyes on to film. 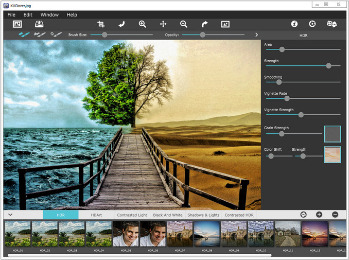 Now, with Simply HDR photographers and hobbyists can automatically convert their images into ones with unparalleled ranges of light and detail. Gone are the days of multiple images; with Simply HDR one picture is all that is required to add dramatic luminescence detail to the brightest and darkest areas of any scene—the result will be outstanding work that is captivating, mesmerizing, revealing and beautifully detailed. Six HDR styles and a library of artistic content is everything needed to create both a realistic HDR photo or a stylized one. We have included a handy smoothing brush for easy corrections to noisy skies and halos*, a library of color filters and artistic content for WOW factor, and adjustable vignettes for darkening edges. If this is your first exposure to HDR we suggest using one of the many one-touch settings. Use the settings as they are or play around with the controls to find your own photographic style. If you like the setting you have created, use the ‘save preset’ feature and apply them to your future projects.